It’s that time of year again! The leaves are changing, the air is crisp… and soon we’ll see freshly carved jack-o-lanterns lining porches and vibrant mums in gardens. Halloween is right around the corner! And it’s never too early to start creating some fantastic costumes to show off at Fort Lee’s Fall-o-ween Spectacular! 1) Like being creative? Build your own DIY costume! Get crafty! Some of the best Halloween costumes are made using the things you have on-hand. Look around your house and in your attic, and let your imagination run wild! Old clothes, some craft paper or extra fabric, and some glitter or paint can really go a long way. We once saw a really great fairy costume made from an old prom dress that was fashioned into a whimsical skirt. They even used some extra tulle and wire for wings! Throw on some glitter, and there’s a recipe for a magically unique costume! 2) Horror buff? Be something scary! We’ve all seen the gorey outfits – which is great if that’s your thing! But what if you wore something a little less expected to take it up a notch? 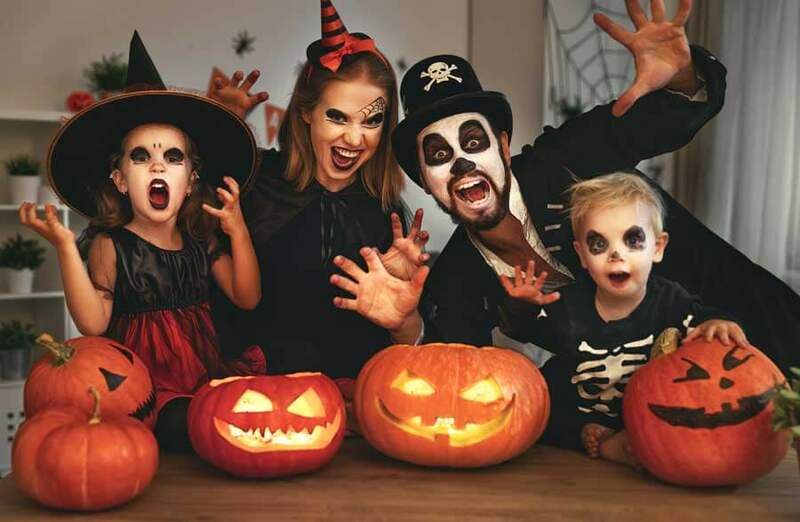 Scary doesn’t have to be gorey, especially if you’re spending the evening with some little ghouls and goblins, so what if you did your makeup like a monster or dressed as a skeleton? Combining ideas could also be a fun way to be unique. Maybe dress up as a skeleton going to dance class! Throw on some ballet shoes and a tutu and dance the night away! You get the idea. 3) Scary not your thing? Create something “Punny”! Deviled Eggs: Wear an egg costume with devil horns! Party animals: Lions and tigers and bears, oh my! With party hats on! Snail Mail: This one could be a great couple’s costume! One person can dress as a snail, the other as a mailman/woman. Group costumes are always a fun way to start conversation! Movies, video games, and occupations are all common themes we’ve seen in past years. For instance, a family who loves “101 Dalmations” might want to dress up as Cruella de Vil, Jasper, and the little dalmations. We’ve seen a PacMan family walking among the streets, as well as beekeepers and their bees! Don’t be afraid to get creative! 5) Why leave Sparky out of the fun? Include your family pet! First of all, almost everyone loves animals, especially when they’re in full costume! Dogs as cats and cats as dogs. Maybe include your family dog into your “Wizard of Oz” theme! Whatever it is, you and your pet are sure to get some instagram-worthy photos and some pretty great comments. Don’t forget to use the hashtag #FortLeeFalloween!